One of my favorite ways to prepare for Christmas is to give small, but beautiful paper craft tree ornaments to friends and family. Over the years I've made lots of different kinds and have gifted wonderful ones made by others as well. 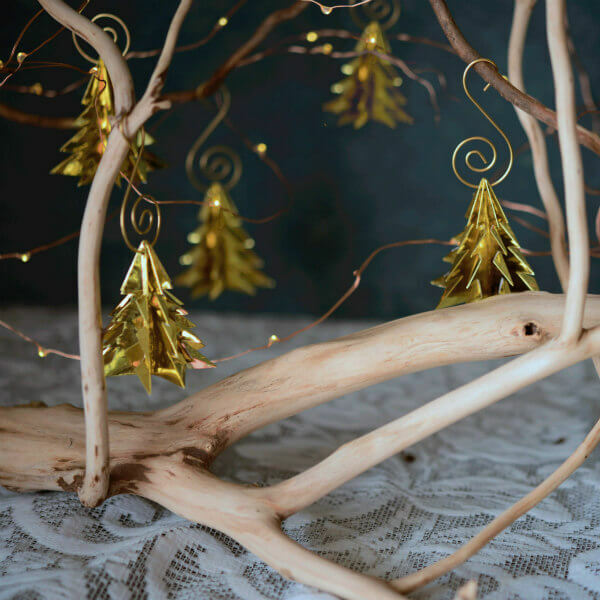 While thinking of ideas for this year, I visited Etsy and rounded up a gorgeous assortment of handmade ornaments... have a look! Maeve S. of Maeve Made Shop in Pittsburgh, Pennsylvania loves to do hands-on projects that require plenty of patience - I'd say she's found her calling! 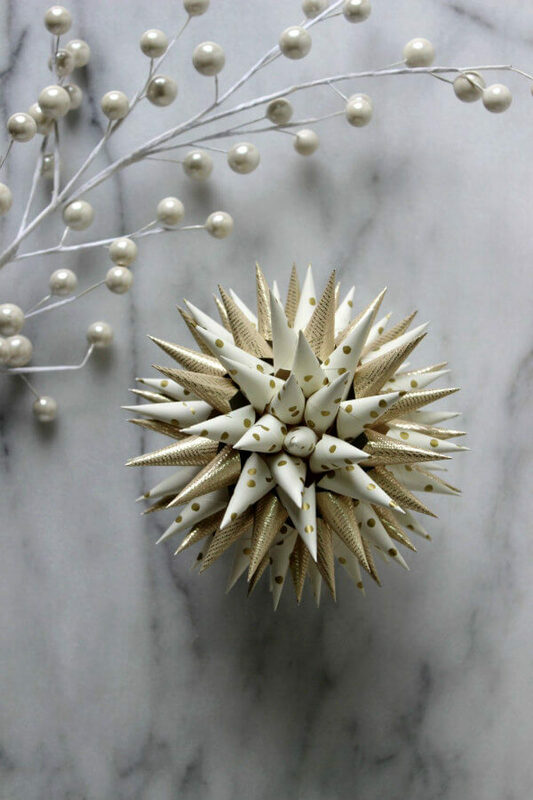 Maeve uses a variety of papers to create Polish Star ornaments, like these pretty golden ones. 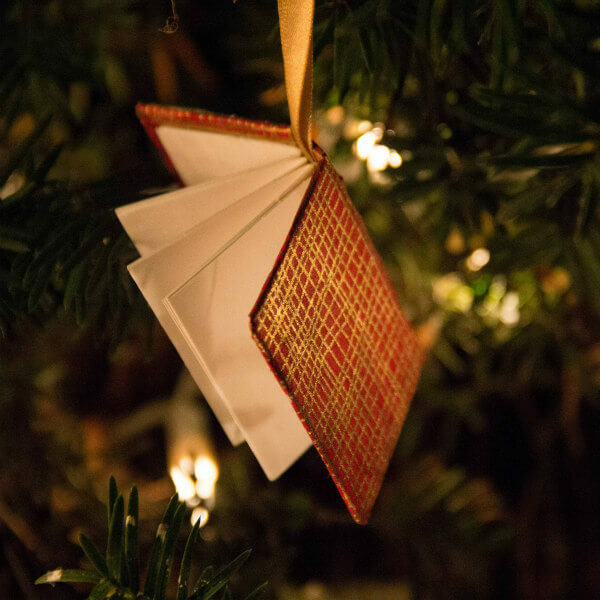 Kelsey Kaptur of Dear Handcrafted in Royal Oak, Michigan makes hand bound journals, as well as tiny blank book ornaments to hang on your tree. She used Lokta paper from Nepal for the cover of this sweet red and gold mini-book ornament and stitched it with waxed linen thread. Fill in the pages with your Christmas traditions or whatever you wish. As an extra touch, Kelsey will hand-calligraph initials in metallic gold ink. 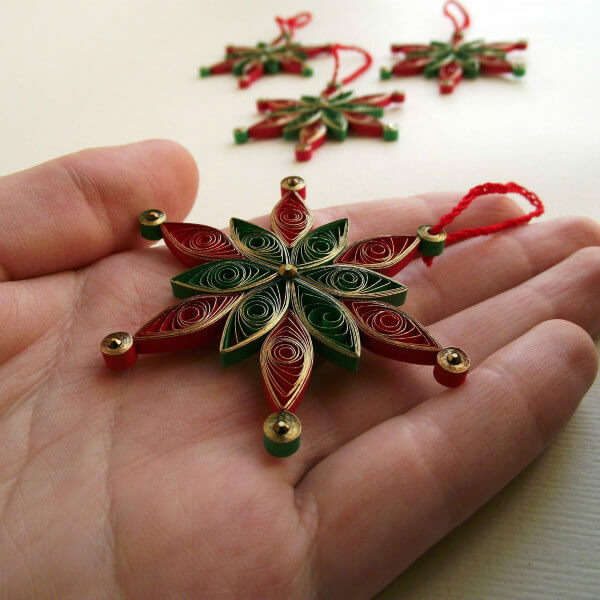 Valeriia of Fox Lab Jewelry in Ghent, Belgium makes quilled paper ornaments and resin jewelry. This metallic snowflake is perfectly formed and so pretty with its shiny edges and gold crystals. Lisa of Blue Dragon Craft in Cleveland, Ohio proudly practices the 5 re's: recycle, reuse, reclaim, reduce, and rejoice. Have a look at her colorful rolled and folded paper ornaments.... there are nearly seventy designs including traditional Christmas themes. 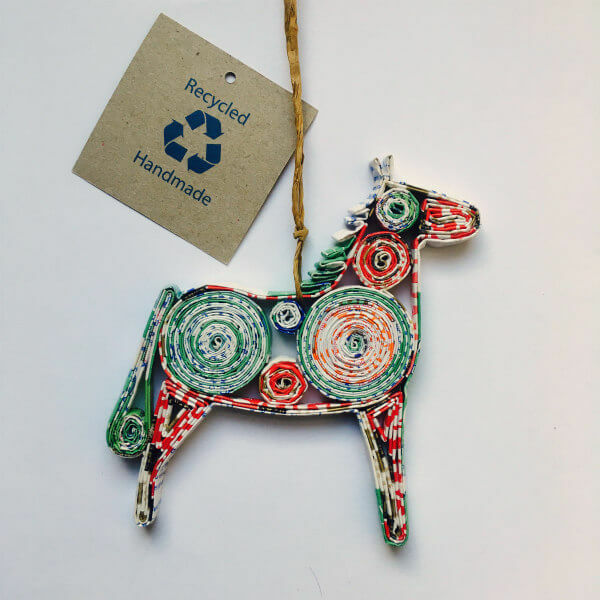 This Dala Horse is one of my faves. 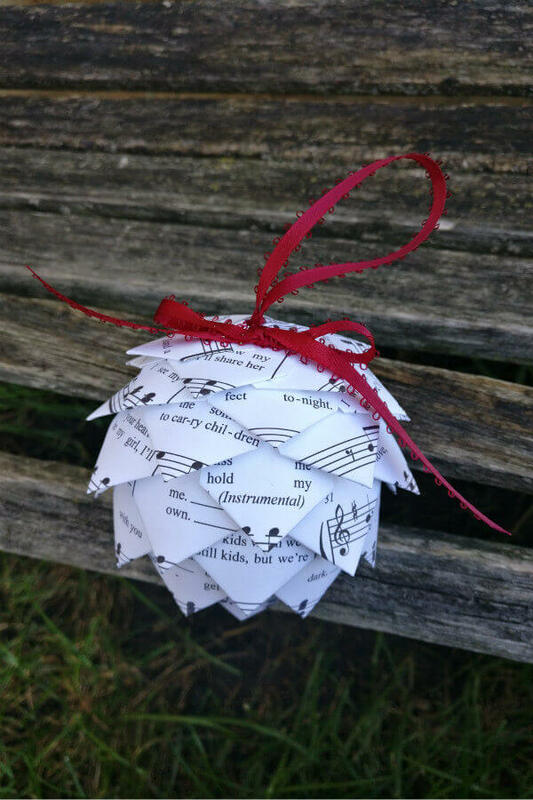 Linsey Skelly of Tree Town Paper in Ann Arbor, Michigan makes pine cone ornaments using all sorts of paper, for example, sheet music, printed text, and maps. This song ornament is very neat... she's happy to create one using lyrics of your choice, as long as the song is downloadable. 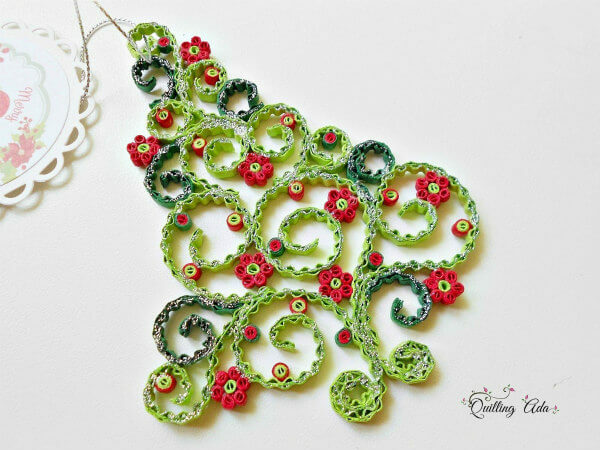 Ada of Paper Art By Ada in Bucharest, Romania makes quilled tree ornaments using finely crimped paper strips that give a lacy look. She enhances the ornaments with silver glitter that you can see sprinkled on the branches of this elegant Christmas tree. 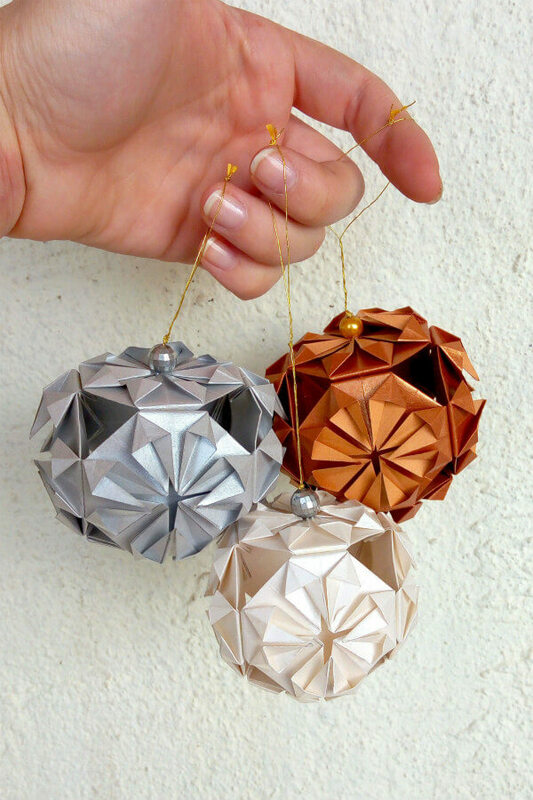 Christy Johnson of Enduring Vision in New York makes origami tree ornaments like these reflective pretties in a variety of colors, and also strings them on rustic roping to be used as mantel decor. The S scroll hangers add such a nice touch. Christa of Wintergreen Design in Vancouver, Canada is a creator of adorable 3D ornaments made of quilling paper. 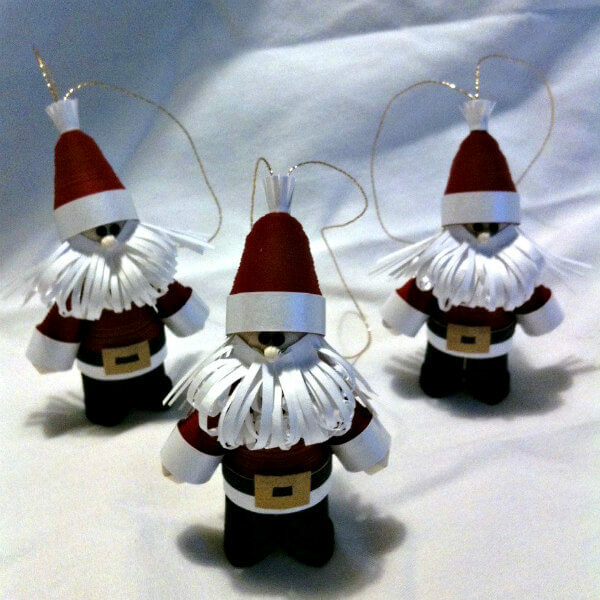 This set of three crimson Santas is just one of many designs... you'll also find detailed reindeer, elves, Wise Men, snowmen, Mrs. Claus, and more. Theodora Mateeva and Angel Boraliev in Varna, Bulgaria of The World in Paper are the creators of intricate origami geo balls, as well as other folded ornaments in different shapes. The metallic papers are as beautiful as the folds are complex. Ha, so apparently hiding a pickle on a Christmas tree is a thing - I know little ones who would enjoy the hunt! 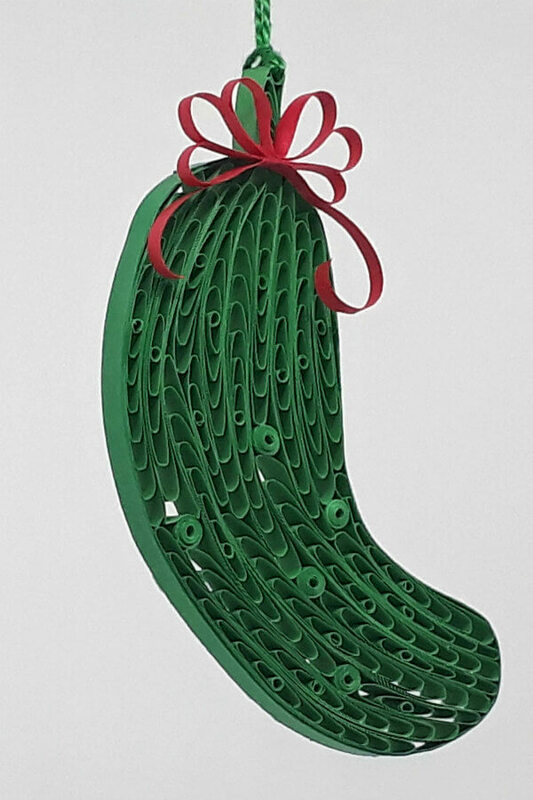 Here's a perfectly quilled pickle ornament made by Nanc Pfruender of Quilling Naturally in Midland, Michigan who offers quite a few styles of ornaments. 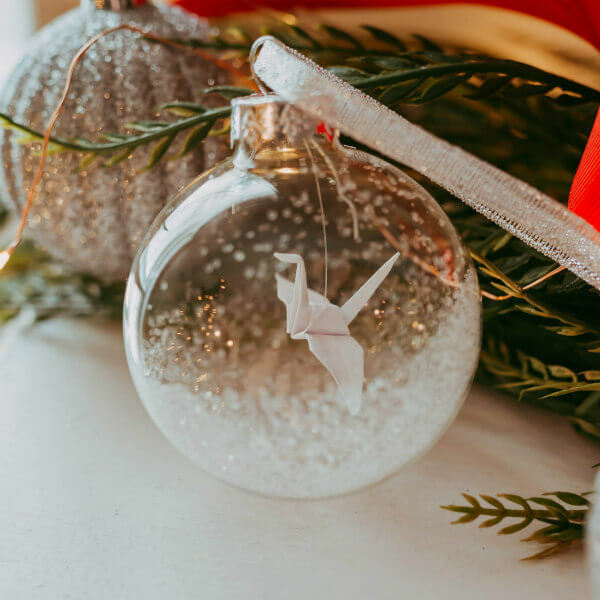 Elizabeth Taylor of Sweet Punk Baby in Asheville, North Carolina makes pretty glass origami crane ornaments, peace crane mobiles, and all sorts of cool baby gear. The sprinkling of glitter adds a festive snowy touch. 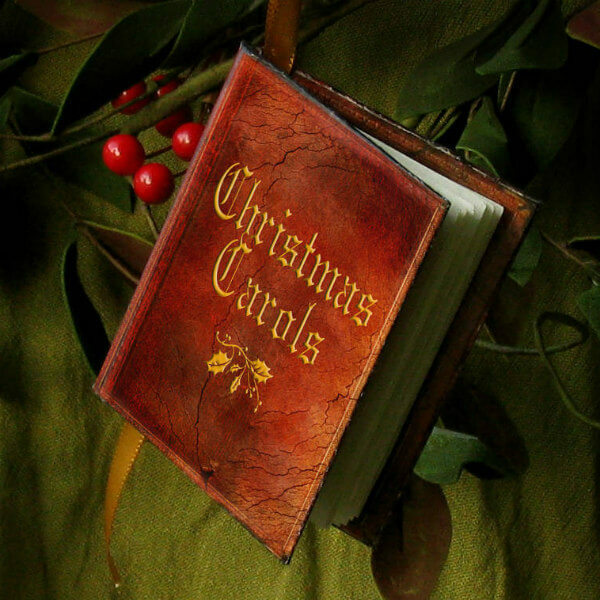 Wendy Talene of Papuan Lass in Lynden, Washington creates pocket-sized books like this beauty that contains a mini-collection of traditional Christmas carols. The hardcover looks very much like an aged, leather-bound tome... she even fashions cracks and worn spots on the leather. Efthimia Kotsanelouof of Efthimia Papier Mache in Rhodes, Greece is a former graphic designer who turns simple paper pulp into all sorts of clever figures. 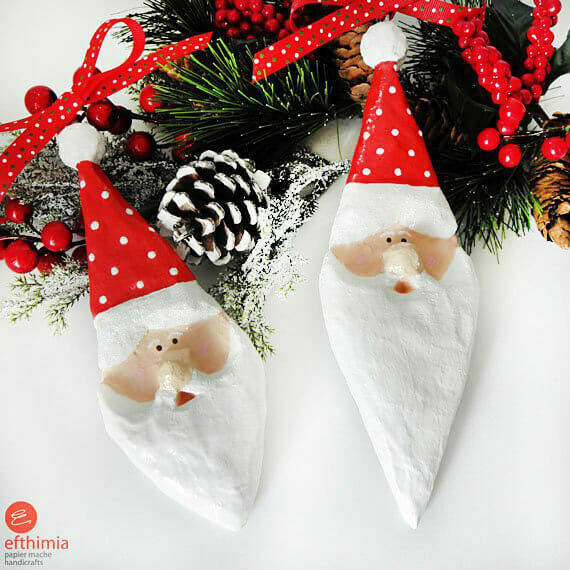 These painted Santa ornaments come as a cute set of two. Diana Arge of Sellerona Studios is a Danish American living in Brooklyn, New York. In addition to making beautiful Danish stars, she is a photographer. 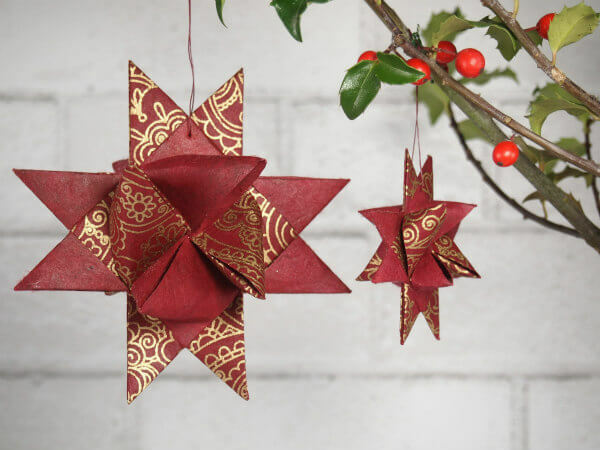 I love the gold henna design on these deep red folded stars. 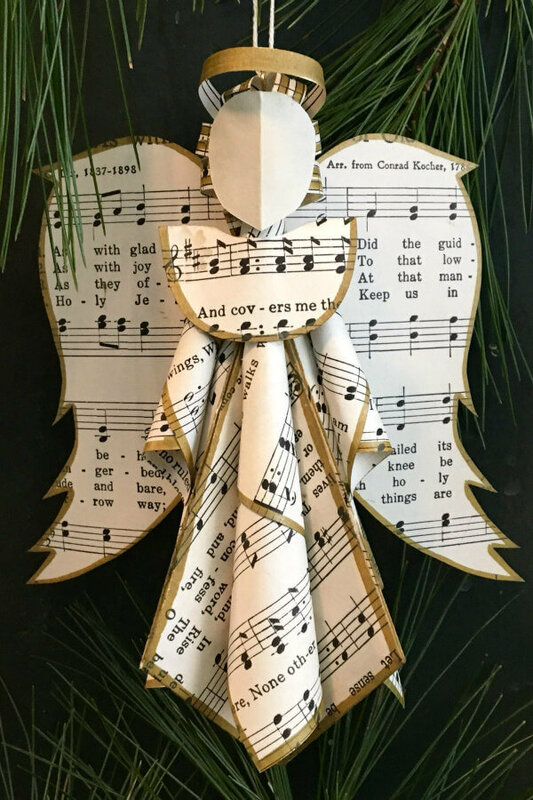 Last but not least, Amelia Jenkins of Doxology Crafts in Deering, New Hampshire makes sculpted paper ornaments and tree toppers using vintage hymnal pages. This pretty angel ornament is enhanced with gold metallic ink along the edges. I've included a link to each shop, as well as to the individual ornaments. Many sellers offer color choices and a variety of designs, so take a moment to click around the shops, AND since it's Cyber Monday, you may even find your favorites at a reduced price! 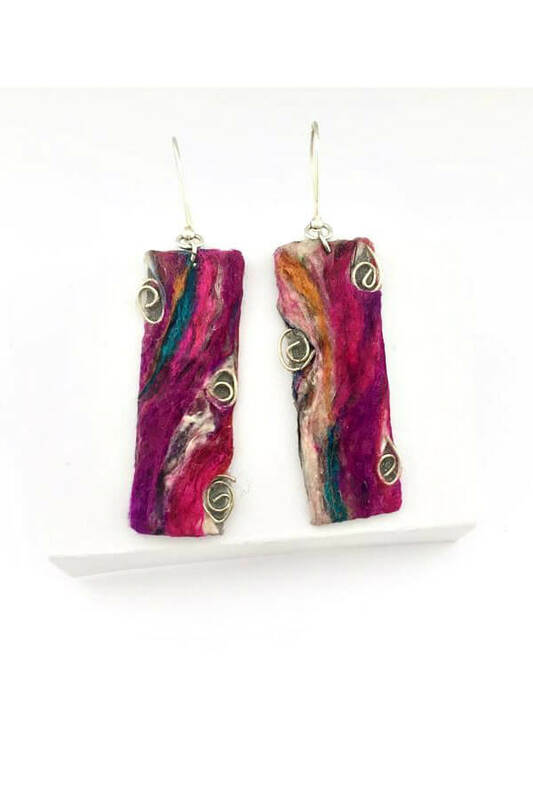 FYI, an international giveaway courtesy of Nikolina Angelova of Etsy shop NiJewels who makes beautifully unique silk thread and paperboard earrings is underway on my Instagram feed, @allthingspaper. It ends next Saturday, December 1st. All Things Paper is an Etsy affiliate. WOW!!! Fabulous handmade ornaments here by very creative artists. Inspired by the metallic snowflake & crimped tree. The two origami ones are also beautiful, while the Polish star is sheer patience. So glad you enjoyed the round up, Leanne... it was a very fun one to put together! Yay! I'm happy you like it, Shirl. Love them all, especially the tiny books! I agree, cate, they are really nice! Beautiful paper ornaments, thank you!